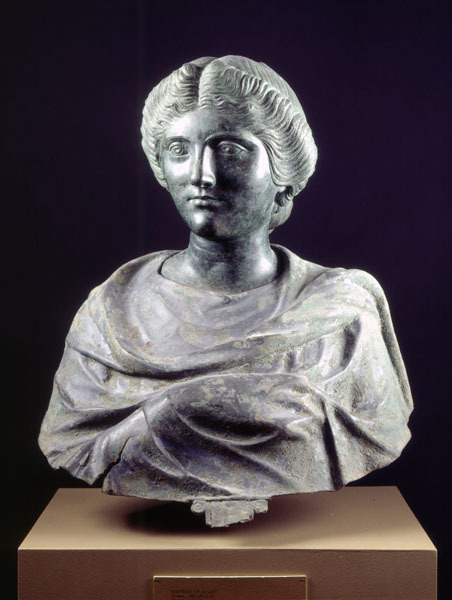 During imperial times upper-class Roman women had far more freedom than did their counterparts in classical Athens. They were able to participate in society, dine with their husbands, and attend parties, games, and shows as well as political gatherings. This rare, life-size portrait bust may have come from a large family shrine of an emperor, perhaps Marcus Aurelius or Septimus Severus. Found together but not attached as a single unit, the head and shoulders, which were probably paired in antiquity, each reflect a different quality of workmanship. While the bust and shoulders are treated summarily, the head is sensitively modeled and the hair minutely detailed in carefully combed waves. The woman's heavy-lidded gaze betrays a contemplative personality as distant as the emperors themselves.